A lot of us grew up with the KJV translation. And I learned Malachi 3:10 from my mother. Bring ye all the tithes to the storehouse that there may be food in my house, and prove me now herewith, says the LORD of hosts, if I will not open the windows of heaven and pour out for you SUCH BLESSING THAT THERE WILL NOT BE ROOM ENOUGH TO RECEIVE IT(emphasis mine). Here are the operative words: “…such blessing that there will not be room enough to receive it.” Note the italicized words: “such.. there will… be room… to receive it.” These words are supplied by the KJV translators to clarify and complete what, in their mind, was the thought behind the Malachi text. “There will not be room enough.” What might the idea behind these words be? The KJV here leads the tither to think of a place or a room to “receive” the blessing, am I not right? A tangible place for a tangible blessing. What is more, the KJV assures the tither that no room will be enough for the blessing he will receive. Each of these words, “lugar,” and “silid,” and “dapit” refers to a physical place, whether a room or a barn. “No room enough.” In other words, even if we take the amount of blessing as hyperbolic[i], still, the place alluded to is physical. You may not want to read this: God promised RAIN in Malachi 3:10! We can thank God He used figurative speech in the 3:10 prophecy, or the tithers among us will have a real problem on their hands! Two consecutive clauses in 3:10 make it plain that God promised RAIN in the Malachi prophecy. Let us study these clauses one by one. Pause and consider this for a moment. Have you seen windows in heaven? What is meant here is not literal windows (as in windows of a house). The clause is a metaphorical language for clouds in the sky. The specific Hebrew words for “the windows of heaven” in Mal 3:10 (haarubbowt hashamayim) are the same exact words the Genesis author used to describe the bursting of the clouds that brought about the Flood in the days of Noah. “…[o]n that day all the fountains of the great deep were broken up, and the windows of heaven (haarubbowt hashamayim) were opened. And the rain was on the earth forty days and forty nights” (Gen 7:11,12, emphasis added). The verb “open” (Heb patach) means “to loosen,” “to open wide.” Hence, “I will loosen and open wide the clouds of heaven,” or “I will open wide the ‘…floodgates of heaven,’” as the NIV picturesquely puts it. Exactly the precursor of rain. Here “open” occurs as imperfect verb, “referring not only to an action which is about to be accomplished but one which has not yet begun.”[iii] And to say the windows of heaven “had been closed” is to say, “the rain had stopped falling from the sky” (see Gen 8:2). Thus, when scripture says “the windows of heaven were opened” it means RAIN. HEAVY rain. ENDURING rain. DRENCHING rain. “Cats-and-dogs” rain! You can the picture. The verb “pour out” (Heb rook) means literally “to open wide,” or “to empty out.” A passage in Genesis is illustrative of this use. Joseph in the story sent his soldiers after his brethren to find the “missing” money. The soldiers of Joseph caught up with the brothers and forced them to open their sacks. This is where we find the Heb word (root): “Then it happened as they emptied (rook) their sacks, that surprisingly each man’s bundle of money was in his sack” (Gen 42:35). 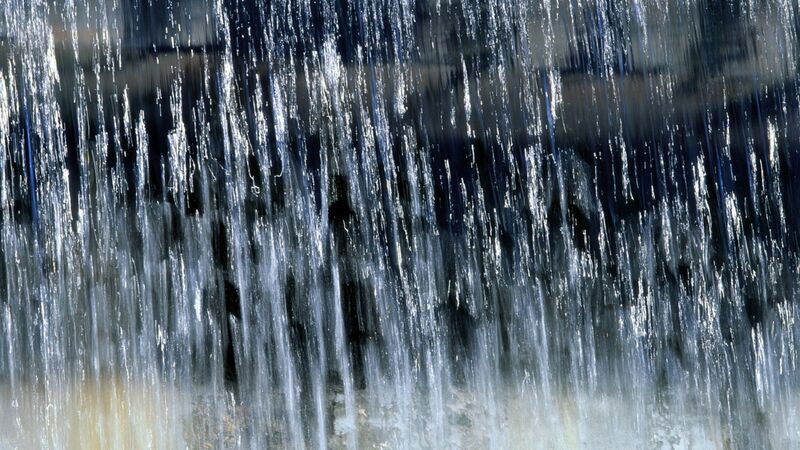 What will God “pour out” from the clouds of heaven? Surely, you are not thinking of a house or a car to suddenly drop from heaven into your room, are you? Surely, the people in Malachi’s time – because most of them were farmers – could not have expected oxen and plows and trees and seeds to fall literally from heaven into their rooms as a result of their tithing now, did they? I believe you get the drift. I see no further need to explain the obvious. Moreover, rook here is in the perfect tense. The perfect expresses a completed action “from the point of view of another action yet future.” Scripture gives example of usage in this sense: “And when she had finished giving him a drink, she said, ‘I will draw for your camels also until they have finished drinking” (Gen 24:19). Applying the information to the Malachi text this is what we come up with: God will pour rain from the opened sky until the clouds are emptied out. “I will open the windows of heaven” is joined by a connective “…and I will pour you out a blessing.” The “opening” of the clouds leads to the “pouring” of rain as a matter of course. But note this: it is “a blessing (singular),” to signify rain that drenches a parched ground; not “many blessings” to signify fruit and other crops to fill the storehouse! Let us do this again. God will pour out rain so much until there is no more to pour because then the clouds will have been completely emptied out of water! In short, God will make it rain to exhaustion! I offer here my free translation. “Bring in all the tithes to the storehouse. And I will open the rain clouds and make it rain until there is no more rain to pour. Absolutely! I mean, I will pour you out so much rain the clouds will be completely emptied! I promise!” And there you have it. What, according to Malachi, are the after-effects of such RAIN? “I will prevent pests from devouring your crops, and the vines in your fields will not cast their fruit (that is, the grapes will not fall to the ground before harvest season),” says the LORD Almighty. “Then all the nations will call you blessed, for yours will be delightful land,” says the LORD Almighty” (3:11,12. NIV). When exactly will the tither be blessed? Well, the rain is a blessing to him. God’s rain will “start the ball rolling” so to speak. The tither will benefit from the rain eventually – but only after he shall have fully completed the period of sowing and reaping. Listen to this. What I have just written does not describe an A to B transaction so to speak. The text does not promise a blessing from God (A) to fall directly upon the tither (B). If that were the case, then we would have created a collapsed middle. For have we not already established that the blessing in view was rain? Are we then to suppose that rain was all a tither could expect under the premises? No; rather the transaction is more of A to B to C. First off, God sends the rain (A), then the farmer tills his ground and plants his seeds and wait patiently for the harvest (B), then the farmer grabs his sickle and harvests his crop (C). The point is, the farmer-tither must now make a deliberate effort to roll up sleeves and go to work. For the ground under his feet has once again become fertile and is practically begging for seeds. The farmer must now clear the ground and plow his plot, he must irrigate his field and sow his seeds, all the while trusting that God will grant him abundant harvest. And when the harvest comes he must yet put his hand to the sickle and reap to his heart’s content. Then, and only after then, may the farmer bring in his tithes to God’s storehouse. Then there will be food in God’s house. Thus, the entire prophecy will have been fulfilled. It is a long obedience in the same direction. [vi] Bring in the tithes, then God will make it rain, then farmer must plant his seeds. Only after then can the farmer harvest his crop. And he will again bring his tithe to God’s storehouse. And God will make it rain…. Are you getting the picture yet? Patience. Determination. Hard Work. Faith. The blessing of the tithe really is reward of a long obedience in the same direction! [ii] This study did not start as an academic exercise. A good friend of mine and partner in the ministry called up not too long ago and we discussed the meaning of some words in Mal 3:10. Was Malachi talking about the tither’s “room”? I wanted to find out. And there is only one thing for me to do – and that is to go to the text itself. In a manner of speaking, my friend opened the door and I walked right in. It didn’t take long for a pastoral concern to grow in me. Hence, this study. I hope the reader will find this edifying. [iii] Textual analyses in this study are all from Strong. [iv] “Enough” occurs in the incident preparatory to the construction of the tabernacle in the wilderness. Moses encouraged the Israelites to bring free-will offerings to the LORD (“all who were willing,” 35:22f) “for the work of the Tent of Meeting, for all its service, and for the sacred garments” (v21). The people responded with much generosity that the workmen reported to Moses, “The people are bringing more than enough (Heb day, i.e., “sufficient”) for doing the work the LORD commanded to be done” (36:5). The passage continues with these words, “Then Moses gave an order and sent this word throughout the camp” ‘No man or woman is to make anything else as an offering for the sanctuary. And so the people were restrained from bringing more, because what they already had was more than enough (Heb day) to do all the work” (vv6,7, NIV). [v] There were basically 2 seasons of rain in ancient Israel on record. “If you follow my decrees and are careful to obey my commands, I will send rain in its season; and the ground will yield its crops and the trees of the field their fruit” (Lev 26:3,4). What were the seasons? “So if you faithfully obey the commands I am giving you today – to love the LORD your God ad to serve him with all your heart and with all your soul – then I will send rain on your land, both autumn and spring rains, so that you may gather in your grain, new wine and oil. I will provide grass in the fields for your cattle, and you will eat and be satisfied” (Deut 11:13-15). But why was God promising rain in the days of Malachi? The people had broken faith with God and had disregarded His Covenant. Thus, God withheld rain from the people. “If you will not listen to me… I will break down your stubborn pride and make the sky above you like iron and the ground beneath you like bronze. Your strength will be spent in vain, because your soil will not yield its crops, nor will the trees of the field yield their fruit” (Lev 26:18-20). Moses said it more starkly in Deut 28:23,24. The land-rain connection under the terms of the Covenant will be the subject of Part Two of this study. [vi] I took the words “long obedience in the same direction” from a book of the same title, A Long Obedience in the Same Direction by Eugene Peterson.